The election campaign is now two weeks old. 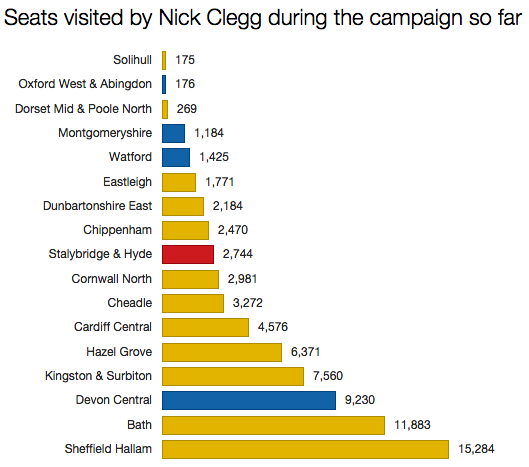 How are the main party leaders getting on in clocking up visits to key constituencies and marginals? It’s a bit of an odd mix of marginals and ultra-safe seats, and it’s telling that to date he’s only been to two of the Tories’ Labour targets. His itinerary has been more shaped by defence than attack. As I mentioned last week, that one foray into a Labour seat was a mistake; Clegg and co thought they were in Hazel Grove, the constituency next door, and had to go back again a couple of days later. 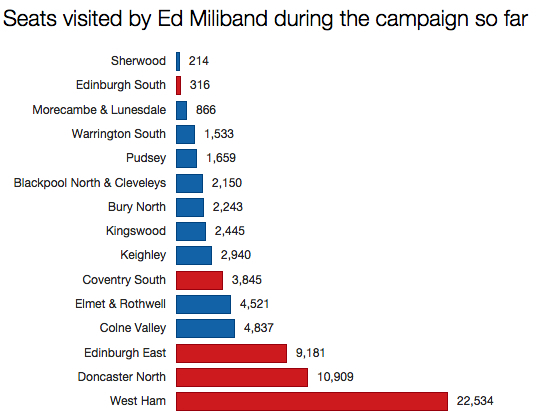 Ed Miliband hasn’t been to a single Liberal Democrat seat so far. Either he thinks all those particular targets are sewn up, or we’ve a dozen visits to Lib Dem territory still to come. 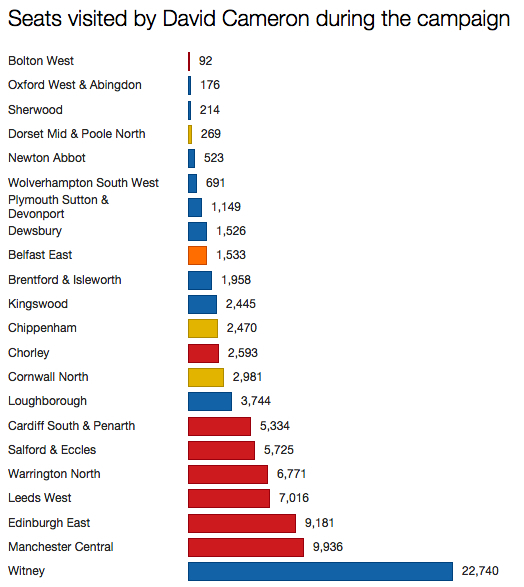 Note also that he’s been to very few Labour marginals. Seven seats have been graced with visits from more than one leader: Chippenham, Cornwall North, Dorset Mid & Poole North, Edinburgh East, Kingswood, Oxford West & Abingdon and Sherwood. I’m sure this number will be in double figures by this time next week. Do you have any info on where Nicola Sturgeon has been? I don’t, I’m afraid. I’ve only been keeping details for the four main leaders.